APRIL 2019 THE SHOP 47 "Good salespeople with significant experi- ence in our industry are good listeners and focus on the customer rather than trying to reduce inventory of a specific model." Herman notes that there are tools avail- able to help with the sales process. "There's a growing importance for shops to have a strong online presence through local searches with tools like Google My Business and social platforms like Face- book," he explains. "Optimizing your Google My Business listing and showing up in Local Search when a potential con- sumer searches for truck bed cover shops Near Me can make all the difference in driving traffic to a shop." WHY THEY WORK The continuing popularity and package sales prospects of tonneau covers make them an attractive add-on for any acces- sory shop. 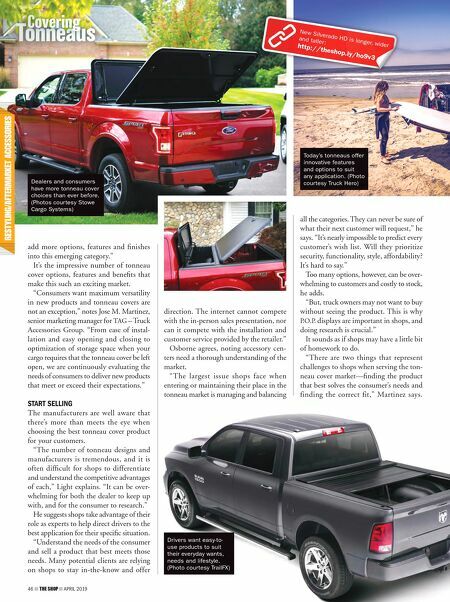 "Tonneau covers are a basic necessity for truck owners. Tonneaus offer the security and function they need for work or for play," says Osbourne. "Upon purchase of a truck, owners are likely to come to a shop to outfit it for their hauling needs. This presents the shop with an opportunity to upsell other products to the cus- tomer, such as fender flares, step bars and more. Shop owners should seize this opportunity as each customer walks through the door." Herman adds that offering both truck bed cover sales and installation delivers enhanced value. "Consumers have the ability to speak to a knowledgeable expert face to face Consumers appreciate professional installation of their tonneau covers. (Photo courtesy Truck Hero) STOWE OFFERS INTEGRATION, PROTECTION, SECURITY AND ORGANIZATION to meet your customer's lifestyles and needs. From the contractor to the weekend sportsman. 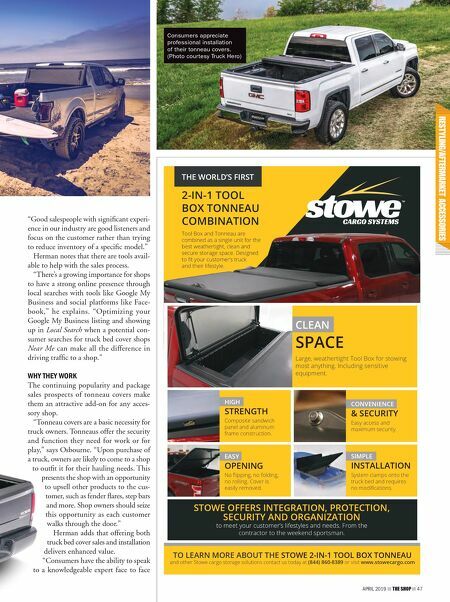 TO LEARN MORE ABOUT THE STOWE 2-IN-1 TOOL BOX TONNEAU and other Stowe cargo storage solutions contact us today at (844) 860-8389 or visit www.stowecargo.com 2-IN-1 TOOL BOX TONNEAU COMBINATION Tool Box and Tonneau are combined as a single unit for the best weathertight, clean and secure storage space. Designed to fit your customer's truck and their lifestyle. THE WORLD'S FIRST CLEAN SPACE Large, weathertight Tool Box for stowing most anything. Including sensitive equipment. HIGH STRENGTH Composite sandwich panel and aluminum frame construction. CONVENIENCE & SECURITY Easy access and maximum security. EASY OPENING No flipping, no folding, no rolling. Cover is easily removed. SIMPLE INSTALLATION System clamps onto the truck bed and requires no modifications.